•Nigeria at risk of circulation of dangerous brands. Few years back, manufacturers of cigarettes sold in Nigeria were compelled to carry warnings on their packs such as “Cigarette smokers are liable to die young” . Warnings such as “The Federal Ministry of Health warns that tobacco smoking is dangerous to health”, “Smoking causes lung cancer, heart disease, and emphysema and may complicate pregnancy”, and “Quitting smoking now greatly reduces serious risks to your health” are widespread, but perhaps what they failed to point out is that cigarettes are licensed to kill. Even though smoking is a “gradual killer”, it is a deadly finisher. A cigarette is the only consumer product guaranteed to kill the user when used exactly as prescribed. All over the world, smoking is routinely linked with adverse health and declining wellness. Smoking is the No.1 cause of preventable death, killing more people than many known non-communicable disorders. Approximately one person dies every six seconds due to tobacco, accounting for one in 10 adult deaths. Up to half of current users will eventually die of a tobacco-related disease such as cancer, cardiovascular and metabolic diseases and other respiratory diseases. While smoking harms the smokers’ health, it also puts lives of people around in danger because they inhale the smoke exhaled (second hand smoking). An investigation by Marie Maurisse, winner of Public Eye’s Investigation Award found that every year, Switzerland exports more cigarettes than it does chocolate. Also, exclusive tests showed that the tobacco industry has double standards: cigarettes sold in Africa are more toxic than those smoked in Europe. One of the major destinations of the toxic cigarettes, according to the report, is Casablanca in Morocco where every smoker favours cigarettes made in Switzerland. It was found that cigarettes produced on Swiss soil and sold in Morocco are much stronger, more addictive and more toxic than those sold in Switzerland or France. For each substance tested, according to the report, nearly all cigarettes produced in Switzerland and consumed in Morocco contained levels higher than that found in Swiss and French cigarettes. The results reveal a double standard – if Moroccans smoke cigarettes that are more harmful than those smoked by Europeans, it can be taken for granted that every other African who smokes actively or passively is at risk. According to the report, Switzerland often promotes the fact that it exports its delicious chocolate, or prestigious watches, to the world. Yet there is another Swiss product that is just as successful, but far less vaunted: cigarettes. In 2016, Switzerland produced 34.6 billion cigarettes – nearly two billion packets. Some 25 per cent were sold on the domestic market. Nearly 75 per cent were exported, providing enough cigarettes for over four million people to smoke a packet a day over the year. Although tobacco sales have fallen by 38 per cent in Europe, over the past 20 years, thanks to preventative campaigns and price increases, the reverse is the case in Africa where producers are increasingly pushing so-called new “reduced-risk products”, which supposedly provide consumers with nicotine without the harmful effects of tobacco. Emerging markets such as Nigeria remain attractive target, no thanks to ineffective regulatory and enforcement activities and weak health policies. 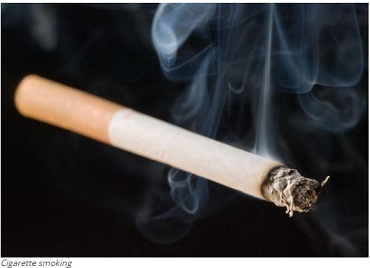 Researchers estimate that 80 per cent of smokers live in low- or middle-income countries. The World Health Organisation (WHO) estimates that there are 77 million smokers in Africa, namely 6.5 per cent of the continent’s population. The institution predicts that by 2025, the figure will rise by nearly 40 per cent compared to 2010 – the steepest increase globally. The number of tobacco-related deaths on the continent will double by 2030 in what the WHO describes as an “epidemic”. In many African countries, there is weak enforcement of laws for preventative measures against tobacco. However, the reverse is the case in Western countries. According to the WHO: “Evidence shows that measures such as taxing tobacco, graphic warning pictures, a full ban on advertising and promotion of, patronage for and help to stop smoking, all serve to reduce demand for tobacco products. Many of the big global tobacco manufacturers engage in widespread lobbying and legal procedures against evidence-based anti-smoking policies going as far as opposing introduction of health warnings on cigarette packets in some countries. In Morocco just like in Nigeria, there is law adopted to ban smoking in bars and restaurants but it is not enforced. However, the bottom line is that smoking is no longer fashionable. Many countries have pushed out some of the toughest anti-tobacco laws and restrictions in history. In many countries smoking openly in public places such as restaurants, airports or bus stops is forbidden. Smoking is restricted in designated places and even when you smoke in privacy, people who see you smoking consider you a nuisance and threat to public health. Family and friends repeatedly tell you smoking will kill you. And they are right.